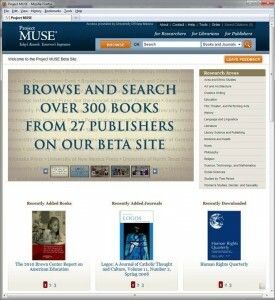 Project Muse is rolling out a beta site that demonstrates their future integration of journals and ebooks. (You’ll need a campus subscription to Project Muse to get to the beta.) The ebook product should go live in January 2012. We can certainly expect the ebooks to be a quality product, like the journals. Muse is collaborating with the University Press Content Consortium to provide “digital books” from about 65 different publishers. According to Project Muse newsletter, the digital and print versions of books will be released by the publishers simultaneously. The ebooks will also offer unlimited simultaneous use and will have no DRM. The files will be PDF. If the beta site is any indication, each book will divided up into individual PDF files for each chapter. I know the intent is to keep the file sizes manageable and to make each book consumable in smaller bites. I think this actually works in a negative way towards download of books to mobile readers. Does anyone actually want to download and manage 15 different files in order to read a single book? There should be a choice to download the entire book. In fact, I’m rather disappointed there won’t be a file option other than PDF. EPUB would work more seamlessly with mobile readers (well, Kindle excepted). One of the points I’m interested in is whether users will really embrace a journals-n-ebooks collection mix. I know several scientific publishers have already been offering this for several years. (See Elsevier and Springer for example.) And the great push in libraryland is to develop discovery layers that integrate everything into one search interface. Still, platforms like Project Muse and JSTOR that have done such a good job with providing journal access are venturing into new territory. (JSTOR will have an ebook product available on about the same timeframe as Muse.) Platforms like this have always been a selective subset of journals. In such a selective environment, does it make sense to integrate journals and books? Of course, their users will love these platforms. The user population for Muse comes primarily from book-centric humanities disciplines. They will likely love having more content and having books added to the mix.